Review of Earthpaste made by Redmond Trading Company- based in Utah: As all of us have different expectations, of course results will vary. These are my experiences with these products, and I don’t expect any product to satisfy 100% of the people who try it, but I can tell you that numerous people have tried this toothpaste & found it to be a wonderful, safe product for their families. Read the back of an Earthpaste tube & you’ll immediately realize you’re dealing with a paste unlike any other: “Earthpaste is safe to eat. Rinse or swallow at your discretion- either would be fine” vs “call poison control center if more than a pea-sized amount is ingested”!!! In fact, the Redmond clay, the main ingredient in Earthpaste, is ingested by many for its medicinal properties. There are few reviews I’ve been more excited to share with this page—why? Because I was on the search for the perfect toothpaste for my family (and one I feel comfortable recommending to the page) for quite some time, and finally found it! Every “natural”, fluoride-free toothpaste I’ve looked at has ingredients that I don’t like, especially for my 2 year old who is still learning how to brush his teeth. Popular brands like Tom’s (owned by Colgate), Jason, and the host of others contain ingredients such as sodium lauryl sulfate (SLS), sodium lauroyl sarcosinate, carrageenan, and a host of others are additives. I kept feeling that there had to be a great, safe toothpaste made in the USA (Jack N Jill is often recommended, but made in Australia). 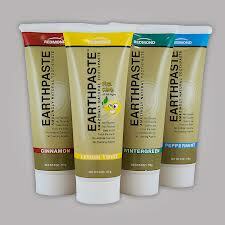 Earthpaste is everything I’ve been looking for in toothpaste & more. Earthpaste is not certified organic, which is an important characteristic for me & many of you. However, it is so highly natural, as it’s made of Redmond Clay & Real Salt which are harvested from deposits deep within the earth, plus Non-GMO xylitol and essential oils (which are all Wildcrafted), that the lack of a “certified organic” label doesn’t bother me in this instance! Unique facts about Earthpaste: *It is free of fluoride. *It does not contain Sodium Lauryl Sulfate (SLS) which is a foaming agent. It can take a bit to get used to a non-foaming toothpaste for adults who are used to such products, but children do not have these expectations so will not know what they are missing! *It does not contain Titanium Dioxide to whiten it. Thus the toothpaste is brown, as its main ingredient is bentonite clay. *It also does not contain glycerin, an ingredient which coats your teeth & prevents them from absorbing beneficial minerals. *It does not contain Carrageenan. Here’s a list of the ingredients Earthpaste does include, with their purpose (from their website): ~~Purified Water to hydrate the clay into a creamy paste. ~~Food Grade Redmond Clay®, a polishing cleanser with antibacterial properties that has been used for centuries to promote digestive health. ~~Xylitol, a natural sweetener that has been shown to promote healthy teeth. ** Also very important to note is they use only non-GMO xylitol from birch and/or corn. ~~ Redmond Real Salt® to enhance the flavor and lend antibacterial properties associated with sea salt. ~~Tea Tree Oil, a natural, essential oil, commonly used to promote healthy skin, supports oral health with excellent anti-viral and anti-fungal properties. ~~Menthol, found in peppermint and wintergreen Earthpaste, leaves your breath fresh and mouth feeling clean. ~~Essential Oils-Wildcrafted These special oils are used for flavoring & a wide variety of other health benefits listed below. ~Peppermint will make your breath smell fresh, and it’s widely used to promote stress relief and support digestion. ~Wintergreen lends a sweet, minty flavor and has been used to promote dental health. ~Cinnamon brings a familiar, spicy flavor along with its reputation as an antioxidant used to promote healthy immune function. The Lemon Twist is their most recent release and contains lemon essential oil, lemon verbana essential oil, tangerine essential oil & lime essential oil. So, which flavor is my favorite? I was sent a tube of each flavor, and before sampling any of the flavors my guess was that I’d love the cinnamon the most. In general I’m not a fan of lemon or peppermint flavors in most things. My expectations were completely backwards. While they all have pleasant flavors, the Lemon Twist & Peppermint turned out to be my favorite. The Lemon Twist is perfect for children as it’s not minty, or spicy as my toddler calls it. It has a fresh, pleasant taste with not the slightest burn. While it’s geared towards kids, it’s neck & neck with the Peppermint as my favorite. The Cinnamon & Wintergreen both are very good too, and if they were the only 2 to choose from I’d use them happily. I’d say the Wintergreen is a little less minty & a little sweeter than the Peppermint, and the Cinnamon has a mild cinnamon flavor. Of course, everyone has their own favorite. I’ve heard from several who don’t like the cinnamon, and others who claim the cinnamon as their favorite. There’s only one way to find out which will be your favorite, but from my opinion, they are all GREAT!! A tube of Earthpaste runs $7.99/4 0z. tube directly from Redmond. They have generously created a coupon just for this page, offering 15% off through September 7 using the code EcoSummer15 (case sensitive), which you can use on their site:http://www.earthpaste.com/. It is also available online through sites such as Vitacost, Amazon & others. How long does a tube last our family of 3? I’d say about a month. This includes the fact that my 27 month old always manages to sneak a squirt into his mouth. He’s gotten much better with me constantly reminding him to brush, not eat it. But he really loves the stuff. I let him choose his color, he almost always goes for the yellow (lemon), but sometimes the blue (peppermint), and being a toddler he insists on putting it on the brush himself. He tries to be sneaky and while squirting some on his brush always does a quick sneak (not so sneaky) to squirt some in his mouth. And he often puts too much on his brush. But the fabulous thing is that I have absolutely no worries about him eating it, and know it’s actually beneficial to his digestion. I can’t imagine going through this training stage using a traditional toothpaste such as Colgate, etc. Maybe he wouldn’t like it as much as Earthpaste and be so inclined to eat it, but I have a feeling he probably would. The peace of mind that comes with using this toothpaste is worth every cent. I also use more than a pea-sized amount. I put a solid line covering my toothbrush, wet it well, and brush away. Given all this, a tube still lasts at least a month. GREAT news for the international fans of the page who often comment that they wish the products I’m reviewing were available to them. Earthpaste is available abroad!!!!! — Australia http://www.gpawholefoods.com.au/ – Earthpaste only. –Canada http://www.trulyorganicfoods.com/– this company sells only Earthpaste. They are FANTASTIC to work with, a small husband and wife home based business. http://well.ca/ http://www.nationalnutrition.ca/default.aspx – Earthpaste only — Internationally everywhere www.iherb.com — UK http://www.phwisdom.com/ – a fantastic company that is buying direct from Redmond shipping to the UK – Most Redmond products can be found through them. http://www.purelynaturalcosmetics.co.uk/ – They also carry most of our Redmond line, Redmond Clay, Real Salt and Earthpaste. I love this toothpaste so much, and was so frustrated with the options on the shelves at my local food co-op (Tom’s, Jason, Auromere) where I do 90% of my shopping, that I talked the co-op management into allowing me to open a wholesale account with Redmond. We now proudly have Earthpaste on the shelves, along with a few other great products from Redmond. We are a tiny co-op, but I look forward to getting as many of their products on our shelves as possible over time! I know it is becoming more available in stores such as Whole Foods, etc. and we get asked often if it’s available locally. At this time Redmond does not have a store locator database. My advice if you can’t find it locally is to request it, and get friends & family to request it also. Most stores are responsive to such requests! I have seen concern raised on my page and others over the use of Xylitol. The research I’ve done has led me to feel it is a safe ingredient & I do not have concerns over its use. Here is some very detailed info on Xylitol, and why Earthpaste uses it: “As I’m sure you know Xylitol is one of those products that although most consider natural, others still have questions about it. That said, most agree that is a natural product because it is a sweetener that occurs naturally. It can be found in berries, fruit/vegetables and also occurs naturally in the human body. The average adult actually manufactures up to 15 grams of xylitol daily during normal metabolism. http://en.wikipedia.org/wiki/Xylitol That said, to produce xylitol for use in baking etc it does go through quite a process which is probably where some of the natural concerns come from – as a side note wheat also goes through quite a process to become bread, and milk goes though quite a process to become cheese, but that’s a different story and a little different chemistry. So why is xylitol in Earthpaste? Mostly because it is a natural sweetener that also has some unique properties that helps it to inhibit bacterial growth. I’ll save you the chemistry lesson, but in short, because xylitol is a 5 carbon sugar rather than a typical 6 carbon sugar, bacteria can’t digest it so they eat it thinking it is sugar and they starve. We considered other natural sweeteners like stevia and others but they just don’t have the properties of xylitol, have harsh flavors, and at the end of the day there are groups that have a lot of questions/concerns about those natural sweeteners too. Aside from all that, there are actually many other oral benefit properties that deal with plaque and tarter that make xylitol nice for a toothpaste (link below). The next question you might ask is why do we want to use any sweetener at all rather than just essential oil? The main reason for that is so more people are willing to be open to trying it to make it possible to economically to produce it at all. Straight essential oils aren’t really taste friendly to most people moving from a conventional toothpaste – especially kids. The problem with having a sweetener in any product is that bacteria thrive on most sugars so if you don’t use the right sweetener you have to add additional preservatives – which we absolutely didn’t want to do. However, xylitol’s properties actually help us not have to do that and also helps more people make the transition away from a conventional toothpaste. We are currently working on a sweetener free Earthpaste that we hope to introduce in a few months – maybe by this summer – for those don’t want any sweeteners. It is coming together very nicely. 🙂 In the meantime if you want to avoid xylitol or other sweeteners, you can just use a clay and salt mix (50/50), wet your toothbrush, dip it in the mix, and then put a drop of your favorite essential oil on it and brush away. I did that for a long time on my own before we finalized Earthpaste and it worked great. Anyway, just like with many (most) natural products on the market today, there will always be a variety of opinions with regards to the advantages and disadvantages of xylitol and other “natural” sweeteners. There is always new information coming out, but it is hard to argue the fact that there are over 2,600 published clinical studies that prove the benefits of xylitol not to mention the fact that our own body produces xylitol and that it is all natural. That said, we can understand that many are undecided about xylitol and we are working on a sweetener free version of Earthpaste. If you are interested in learning more, here is another summary on the other side of the xylitol story: http://knowitallhealth.com/2008/01/29/xylitol-the-all-natural-sweetener-thats-good-for-you/ and here is a summary of what xylitol is and is from those that like it: http://www.xylitol.org/questions-about-xylitol. I know you can find plenty of those that don’t like and many more that do so I just wanted to include a couple you can consider and decide for yourself.” As you can tell, I’m very happy with this toothpaste. I love what it doesn’t include almost as much as I love what it does include. I’m very happy to recommend this product as often as I possibly can on my page & others when I see a question regarding the best toothpaste for children, and adults. Again, here is the coupon code to save 15% off your entire purchase through Redmond: 15% off through September 7 using the code EcoSummer15 (case sensitive). One last thing I’ll mention is that I’ve had a great experience with my interactions with Kimberly, my go-to at Redmond with any questions I have. I have also heard from many of you that you’ve had a great customer service experience with this company, which means a lot to me! I haven’t been able to look carefully at all your posts, so I apologize if I have missed this info, but what toothbrush do you use for your little guy? I saw your post on Preserve brushes. Looks like they are plastic but BPA free. Do you know if they are tested for other things (ie phthalates, lead, etc.)? I have a 6 month old and he has just sprouted two teeth so I have to get a toothbrush for him. Thanks again for all the info and hard work! PS can’t wait to try Earthpaste! Thank you for your question and your interest in Preserve. Preserve products are made exclusively with recycled polypropylene (#5) plastic, which does not require BPA, PVC or phthalates. BPA is typically found in #3 plastics and polycarbonates. Polycarbonates are part of the miscellaneous category of plastics, labeled #7. PVC is also only present in #3 plastics. Additionally, Preserve products have been tested for leaching by independent labs. These tests have consistently shown that our plastic meets leaching requirements more rigorous than the standards set for tap water. These tests have also shown that Preserve products are BPA, PVC, and phthalate free. For more information, please feel free to read over a previous e-newsletter at this link: http://www.preserveproducts.com/ourprocess/safe-plastic.html. Thank you again for letting us know of your concerns, and please contact me if you have any additional questions!